Elegant and old-fashioned shrimp cocktail reached a peak in popularity in Prohibition. With stemware out of service in most establishments, the cocktail glasses were used for the curvy crustaceans, which were draped over the edges. Today, shrimp cocktail seems like a retro classic, something old-fashioned restaurants offer, partly because cooked, frozen shrimp is widely available, as is bottled cocktail sauce. You don’t have to reinvent the dish, but a homemade version of poached shrimp in a flavorful broth takes it to another level. Shrimp at your market are mostly labeled “previously frozen” and are defrosted at an indeterminate time. You’re better off buying frozen unshelled shrimp with “IQF” (individually quick frozen) on the label. They’re flash frozen at the the harvesting site and defrost quickly in a cold-water bath. Pink and white domestic frozen shrimp from the Gulf of Mexico are the best choice if you want to avoid imported shrimp, which have controversial harvesting practices. To peel a shrimp, grasp it by the tail. Start at the large end (where the head was), pull off the legs and outer shell together, and leave the tail segment attached and unpeeled. With a paring knife, make a shallow cut along the curved edge of the shrimp and tease out the mud vein with the tip of the knife. Put the cleaned shrimp into ice water so they curl nicely later. To cook, follow one hard-and-fast rule: Do not boil shrimp because delicate proteins will seize, shrink, and turn rubbery at high temperatures. Instead, poach the shrimp in water that is between 165 and 175 degrees — the temperature obtained after you drop cold shrimp into simmering liquid. If you want to cook a lot of shrimp, do it in 1-pound batches. Keep the cocktail sauce clean with only ketchup or tomato-based chile sauce, lemon juice, and horseradish. Buy fresh horseradish root and peel and grate it finely, or purchase prepared white horseradish in a jar (in the refrigerated section; but do not mistakenly get horseradish sauce, which is creamy). 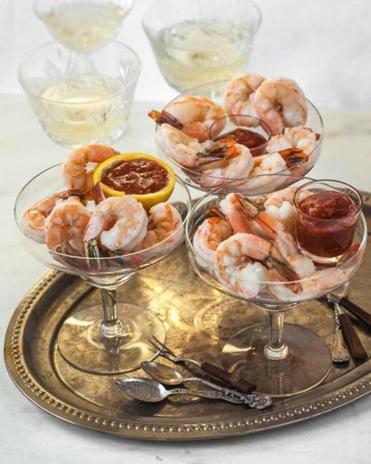 As for presentation, skip the old-fashioned ice bed and heap the shrimp in a glass, stemmed or not. Place the cocktail sauce in a small dish, shot glass, or hollowed-out lemon half. Let the festivities begin.